A south-of-the-border celebration does not kick into gear without margaritas, so why settle for plain margarita glasses? 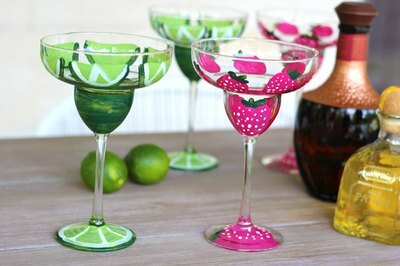 These glasses, hand-painted with limes and strawberries, are easier than you'd think to recreate. And they're sure to get everyone in the party spirit. First, prepare the glass surface for painting. 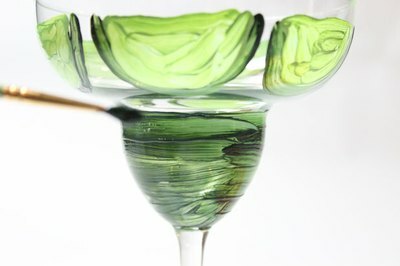 Wash the margarita glass with hot soapy water, rinse, and dry. 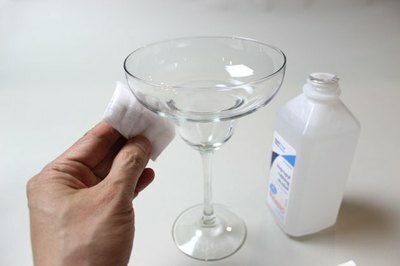 Then clean the surface of the glass with a cotton square dipped in rubbing alcohol to remove any remaining oily residue. Painting on the glass freehand is difficult for most people. 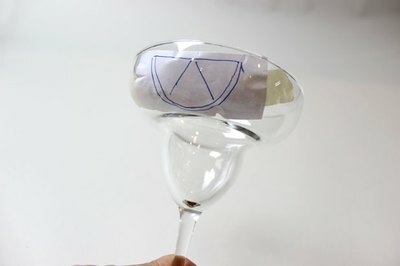 It is much easier to draw an image on a piece of paper and tape it to the inside of the glass. This way, you have a pattern you can trace with the paint brush. This one image of a lime slice will be repeated around the glass. Dip a narrow paint brush in enamel paint, and trace the pattern. Look for water-based enamel paints in the crafts store. They are easy to work with and easy to wash off with water. As you paint, don't worry about brush marks or imprecise painting. The imperfections give the glass an artisan feel. Keep moving your template around the glass to continue painting limes. Paint the peel of the lime a dark green, and the fruit section a lighter green. 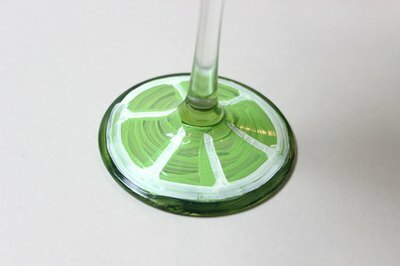 The middle section of the margarita glass actually looks like a lime cut in half, so cover this section in dark green paint. When the paint dries, usually within an hour, paint the next layer, which is the white membrane of the rind. Using a narrow paint brush, paint some white paint along the inside edge of the dark green peel, as well as two lines within the light green section to create "wedges." On the base of the glass, paint the outer rim a dark green and the inside a light green. When it dries, paint the wedges with white paint. If it helps, draw a template first and place it under the glass to trace. The technique to paint strawberries is similar to that of painting the limes. 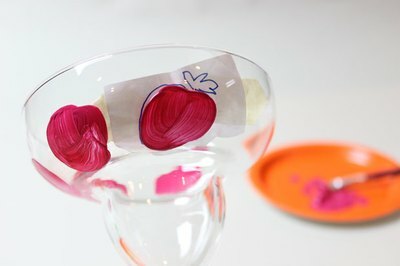 Draw a strawberry on a piece of paper and tape it to the inside of the glass. Then paint within the lines with red paint. 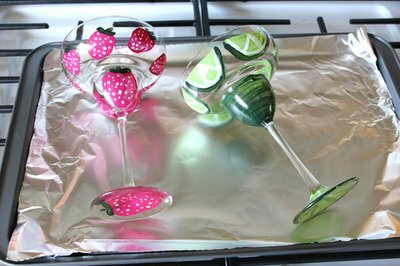 Move the template around the glass to paint several strawberries. Use a narrow paint brush and dark green paint to draw the green leafy section of the strawberries, called the "hull." When the red paint is dry, paint seeds by dipping the wooden end of a brush in white paint and dabbing the point onto the glass. 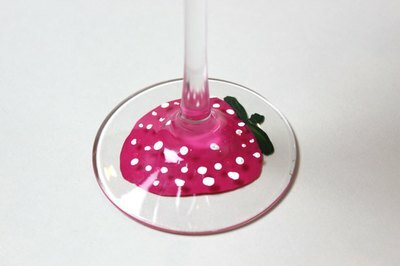 Because the stem is in the way, painting a strawberry at the base might seem difficult. But there's a trick. 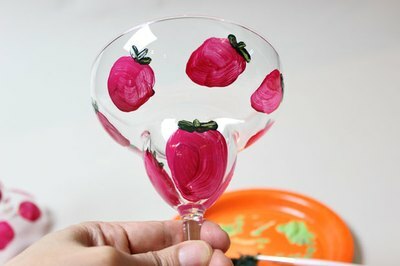 Just turn the glass upside down and paint the strawberry on the bottom of the base. You will see the design through the glass. 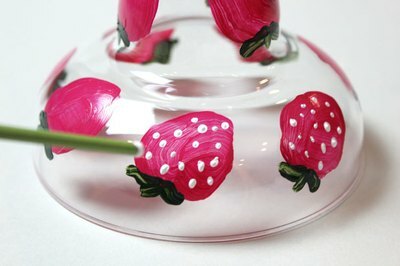 Paint the white seeds on the top of the glass base, and they look like are on the actual strawberry. If you have never painted glass with enamel paint before, try practicing on a spare piece of glass first to become more comfortable with the technique. The paint should never come in contact with food or drink, which is why the paint should only be applied to the outside of the glass. The paint should never come in contact with your lips, either. Keep the paint designs at least 3/4" below the rim of the glasses so lips don't brush against them as people are drinking.